The variance that exists in poker makes an all-encompassing dominant performance in a tournament highly unlikely. Add 37 of the best players in the world who have put up $100,000 to buy in to the tournament and that task comes close to impossible. But that is nearly what Sam Trickett accomplished to win the $100,000 Challenge at the 2011 Aussie Millions at Crown Casino in Melbourne, Australia. He took the chip lead early on the first day of the event and by the time the final table was set at the end of day 1 he had grown his stack to 961,000 to pace the field. His victory wasn’t a wire-to-wire win though. He suffered a big setback near the start of the final table when fellow Englishman Tony Bloom doubled up through Trickett and he saw his stack fall to 400,000. That misstep didn’t stop Trickett from eventually climbing back to the top though, surviving and growing his stack while big names like Erik Seidel, David Benyamine, and Jeffrey Lisandro hit the rail. A three-handed battle with Seidel and Bloom was a particularly competitive stretch at the final table, but by the time heads-up play began Trickett held the lead once again. It took a short time for him to top Bloom in the heads-up final and the young professional grew his career earnings above $3 million thanks to the $1,525,000 payday for first place in this prestigious event. Ferguson became the first of two unlucky players who didn’t garner any prize money at the final table when his A-8 was dominated by the A-J of Bloom a half hour into play. There was no help on the board and Ferguson was out in eighth place. Lisandro was the other player to go home empty handed, busting in seventh place. His pocket tens were no match for the pocket aces of David Steicke. Benyamine became the first player to walk away with prize money, taking home $150,000 in sixth place. His A-J was dominated by the A-Q of Trickett preflop, and the eventual champion found a second queen on the flop. Australian James Obst was on the short stack after that and it didn’t take long for him to fall in fifth place, which was good for $200,000. His K-10 in the hole was unable to catch up to the pocket jacks of Bloom after Obst committed the last of chips preflop. Steicke was eliminated in fourth place and he took home $325,000 in prize money. He now holds $2 million in career earnings thanks in large part to his consistent success at high-roller tournaments. 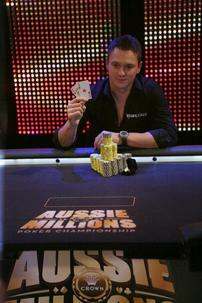 The Hong Kong resident won the Aussie Millions $100,000 Challenge back in 2009. Bloom won the hand to grow his stack heading into the heads-up final and Seidel was eliminated in third place. He took home $625,000 in prize money. Even with the knockout punch he scored Bloom still faced a 2-1 chip disadvantage when cards got into the air in the final against Trickett, who scored a straight early in the final to grow his chip lead above 3 million while Bloom was below 1 million.